Methanol has attracted increased attention as a non-food alternative carbon source to sugar for biological production of chemicals and fuels. Moreover, the high degree of reduction of methanol offers some advantages in increasing the production yields of NAD(P)H-dependent metabolites. Here, we demonstrate an example of methanol bioconversion with the aim of improving production of NAD(P)H-dependent chemicals in synthetic methylotrophic Escherichia coli. A synthetic methylotrophic E. coli was engineered with a nicotinamide adenine dinucleotide (NAD+)-dependent methanol dehydrogenase (MDH) and ribulose monophosphate (RuMP) pathway. Regarding the limited MDH activity, the role of activator proteins in vivo was investigated, and the NudF protein was identified capable of improving MDH activity and triggering increased methanol metabolism. Using 13C-methanol-labeling experiments, we confirmed methanol assimilation in the methylotrophic E. coli. A cycling RuMP pathway for methanol assimilation was also demonstrated by detecting multiple labeled carbons for several compounds. Finally, using the NAD(P)H-dependent metabolite lysine as a test, the potential of methanol bioconversion to generate value-added metabolites was determined. To further characterize the benefit of methanol as the carbon source, extra NADH from methanol oxidation was engineered to generate NADPH to improve lysine biosynthesis by expression of the POS5 gene from Saccharomyces cerevisiae, which resulted in a twofold improvement of lysine production. Moreover, this new sink further pulled upstream methanol utilization. Through engineering methanol metabolism, lysine biosynthesis, and NADPH regeneration pathway from NADH, the bioconversion of methanol to improve chemical synthesis was successfully achieved in methylotrophic E. coli. Microbial production of chemicals and biofuels from feedstock that are both inexpensive and abundant, such as natural gas, offers sustainable and economically attractive alternatives to traditional fermentation processes [1–3]. Given advances in methods of converting natural gas to methanol, methanol has attracted increased attention as a non-food alternative carbon source to sugar in microbial production processes [4–6]. Meanwhile, as the higher reduction degree of methanol than most lignocellulosic sugars, it might be used to enhance the production of some reductive products, such as alcohols, carboxylic acids, and fatty acids when used alone or as a co-substrate. Methylotrophs represent a group of organisms that use methane or methanol as carbon and energy sources to produce metabolites, including biofuels and chemicals. Efforts to engineer native methylotrophs (e.g., Bacillus methanolicus, and Methylobacterium extorquens) [7–9] have been hampered due to the inefficient genetic tools. Developing synthetic methylotrophy using platform organisms, such as Corynebacterium glutamicum and E. coli, has become an increasingly attractive possibility for methanol bioconversion [10–12]. In aerobic methylotrophs, methanol is initially oxidized to formaldehyde by methanol dehydrogenase (MDH). Formaldehyde is subsequently assimilated for energy generation via the serine pathway, the ribulose monophosphate (RuMP) pathway, or the ribulose bisphosphate (RuBP) pathway . The MDHs can be divided into three classes based on their electron acceptor: pyrroloquinoline quinone (PQQ) dependent in Gram-negative bacteria, NAD dependent in Gram-positive bacteria, and oxygen dependent in methylotrophic yeasts, respectively [5, 13, 14]. As a favorable option for synthetic methylotrophy , electrons, derived from methanol oxidation that was catalyzed by NAD+-dependent MDHs, are stored in NADH, which can be used to improve production of target metabolites without sacrificing additional carbons. 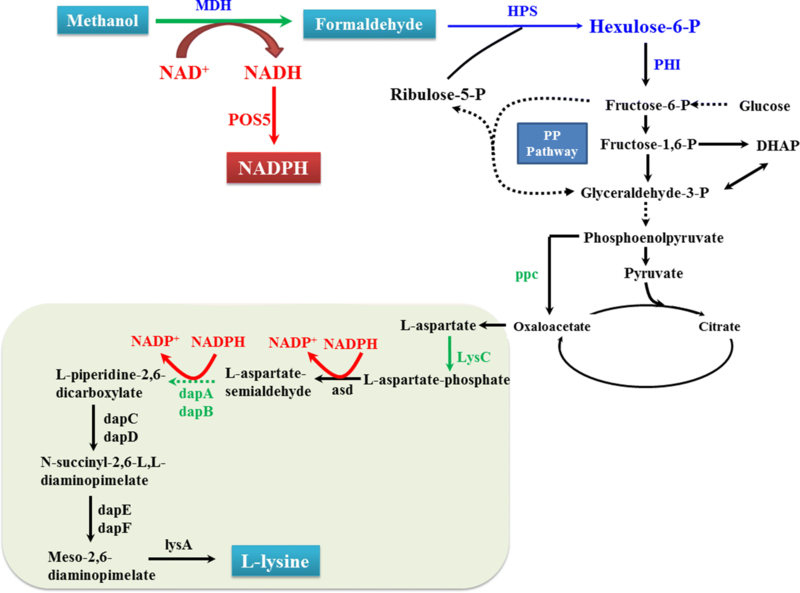 For the formaldehyde assimilation process, the RuMP pathway, which fixes formaldehyde to the pentose phosphate pathway (PPP) intermediate ribulose-5-phosphate via the two core enzymes, including 3-hexulose-6-phosphate synthase (HPS) and 6-phospho-3-hexuloisomerase (PHI) , has been shown to be more bioenergetically favorable in terms of ATP generation. Escherichia coli is an important platform organism that has been extensively engineered for superior industrial production of an enormous range of useful metabolites. In the past few years, several efforts to engineer improved methanol utilization ability in E. coli have been made. For example, in 13C-methanol-labeling experiments, 13C-labeled glycolytic intermediates were detected in synthetic methylotrophic E. coli . Using MDH from B. stearothermophilus and the RuMP pathway from B. methanolicus, 30% improvement in biomass was observed in a methylotrophic E. coli strain and methanol-derived naringenin production . Bennett et al. further improved methanol assimilation by expressing the nonoxidative pentose phosphate pathway (PPP) from B. methanolicus. However, the effect of methanol consumption on intracellular cofactor levels, such as NADH and NADPH, was rarely characterized in synthetic methylotrophy, as well as the use of excess electrons from MeOH consumption to improve the yields of desirable metabolites. 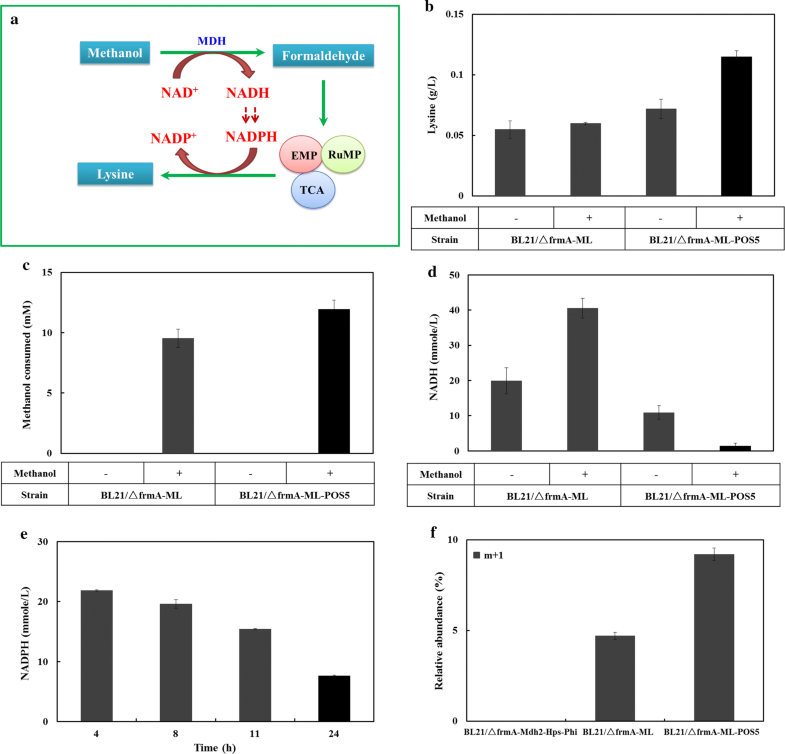 In the present study, a synthetic methylotrophic E. coli was engineered by employing the NAD+-dependent MDH and RuMP pathways. Two MDH activator proteins were then coexpressed to analyze their role in regulating methanol metabolism in vivo, and the protein NudF was found capable of improving methanol metabolism. After optimizing the culture condition, 13C-methanol-labeling experiments were carried out to confirm the methanol assimilation in methylotrophic E. coli. Finally, with lysine as an example, the possibility that bioconversion of methanol to generate value-added metabolites was determined. The extra NADH from methanol oxidation was also engineered as an alternative way to generate NADPH for improving biosynthesis of the desired metabolites. Due to the higher generations of ATP and NAD(P)H, we considered the NAD-dependent MDH and -RuMP pathways being most favorable for engineering synthetic methylotrophy [5, 12, 15]. Enzymes with high catalytic activity are prerequisites for efficient engineering of the desired phenotype, and Mdh2, Hps and Phi from B. methanolicus had previously been determined to be the most effective . Based on these previous results, the methanol metabolic pathway was assembled in E. coli BL21(DE3) (Fig. 1). We then analyzed the activities of MDH and HPS-PHI to identify whether the enzymes for methanol metabolism were functionally produced and activated in E. coli BL21(DE3). The MDH activity in E. coli BL21(DE3) was evaluated by the measurement of formaldehyde accumulated. After 120 min, the formaldehyde accumulation was successfully detected (Fig. 2a), followed by a decrease in formaldehyde concentration, suggesting the activity of endogenous formaldehyde degradation pathway. To identify the activity of HPS-PHI, formaldehyde degradation of the whole-cells was tested. Formaldehyde was degraded in both the wild-type strain and HPS-PHI-expressing strain, although the HPS-PHI-expressing E. coli strain exhibited a higher degree of degradation (Fig. 2b), confirming the activity of HPS-PHI in E. coli BL21(DE3). These data indicate that the methylotrophic enzymes required for methanol utilization are functionally expressed in the engineered E. coli BL21(DE3) strain. However, the endogenous formaldehyde degradation pathway in wild-type E. coli was found to be highly activated. To avoid their effect on methanol fixation efficiency, an E. coli mutant strain, ΔfrmA, with a deletion in formaldehyde dehydrogenase, was constructed to prevent the endogenous degradation of formaldehyde and used as the host cell in the following experiment. The NAD+-dependent MDHs from Bacillus spp. have lower affinity toward MeOH compared to higher alcohols. It has been reported that in vitro activity of B. methanolicus MDH could be increased by the endogenous activator protein ACT . To test whether the ACT from B. methanolicus could increase the MDH activity in E. coli in vivo, the ACT protein was coexpressed in E. coli BL21(DE3). The presence of ACT had a positive effect on the in vivo activity of MDH in E. coli, which was increased to 29.1 mU/mg from 22.1 mU/mg (Table 1). ACT belongs to the enzyme family of Nudix hydrolases and uses NAD+ as a substrate . Ochsner previously showed that in vitro activity of B. methanolicus MDH could also be improved by other ACT-like Nudix hydrolases . As a member of the Nudix hydrolase family, NudF from E. coli  was overexpressed to test its effect on in vivo activity of MDH in E. coli BL21(DE3), which significantly increased MDH activity by 2.1 times compared with that by ACT (Table 1). 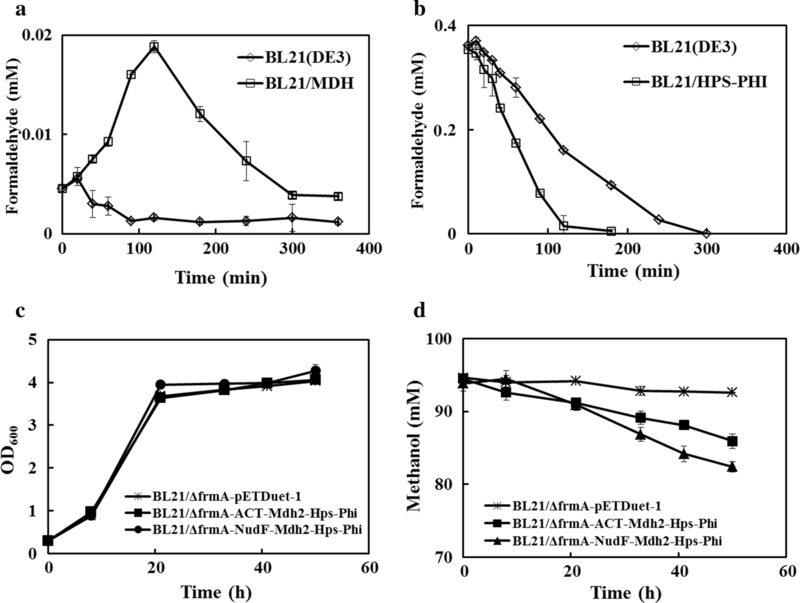 To further determine the effect of activator proteins on methanol utilization, the engineered strains BL21/ΔfrmA-Mdh2-Hps-Phi, BL21/ΔfrmA-ACT-Mdh2-Hps-Phi, and BL21/ΔfrmA-NudF-Mdh2-Hps-Phi were cultured in M9 medium supplemented with 55 mM glucose and 100 mM methanol. Little difference in growth was observed in the strains BL21/ΔfrmA-pETDuet-1 and BL21/ΔfrmA-ACT-Mdh2-Hps-Phi, and a slight growth increase was observed in the strain BL21/ΔfrmA-NudF-Mdh2-Hps-Phi (Fig. 2c). After fermenting for 50 h, the strain BL21/ΔfrmA-NudF-Mdh2-Hps-Phi consumed 11.9 mM, while 8.0 mM methanol was consumed by the stain BL21/ΔfrmA-ACT-Mdh2-Hps-Phi (Fig. 2d). These results further indicated the positive role of protein NudF in regulating methanol utilization. The addition of yeast extract could improve methanol utilization . 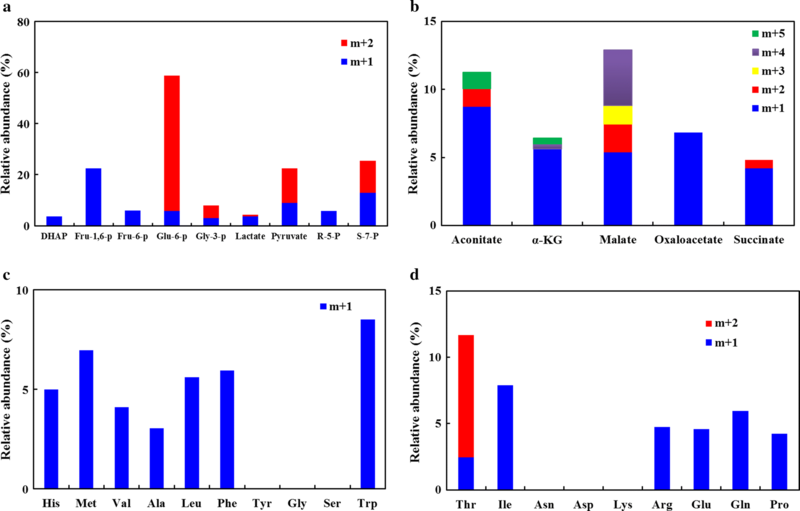 Given the important role of the nitrogen source, different nitrogen sources were added into the medium to investigate their influence on methanol metabolism of the strain BL21/ΔfrmA-NudF-Mdh2-Hps-Phi (Fig. 3a). Consistent with the previous study , the addition of yeast extract moderately improved the methanol utilization from 10.2 mM to 11.3 mM. With regard to the other nitrogen sources, the presence of peptone and steepwater had little effect on methanol metabolism. Notably, the methanol metabolism was largely improved by the addition of malt extract, where 18.4 mM methanol was consumed after fermenting for 50 h. Subsequently, the methanol concentration in the medium was optimized. Under the methanol concentration ranging from 25 to 100 mM, its inhibition on growth was not observed (Additional file 1: Figure S1). A maximum methanol consumption rate was observed when 50 mM of methanol was supplemented (Fig. 3b). After fermenting for 50 h, 21.2 mM of methanol was utilized totally, which was the highest methanol consumption level in synthetic methylotrophic E. coli reported to date [12, 15]. Meanwhile, a higher biomass was obtained when methanol was used as a co-substrate (Additional file 1: Figure S1). To confirm methanol assimilation by the recombinant E. coli BL21/ΔfrmA-NudF-Mdh-Hps-Phi, 13C-methanol-labeling experiments were carried out in M9 medium supplemented with 55 mM glucose and 50 mM 13C-methanol. The cells were sampled after about 25 h when the maximum methanol consumption rate was observed. Detected metabolites mainly included the intermediates associated with glycolysis, the pentose phosphate pathway (PPP), and the tricarboxylic acid (TCA) cycle (Fig. 4). After cultivation for 25 h, 58.7% of Glu-6-p, 3.6% of DHAP, 22.4% of Fru-1,6-p, 8.0% of Gly-3-p, and 22.5% of pyruvate contained labeled carbon that originated from methanol (Fig. 4a). The labeling of TCA intermediates included 6.8% of oxaloacetate, 11.3% of aconitate, 6.4% of α-KG, 12.9% of malate, and 4.8% of succinate from methanol (Fig. 4b). In addition, we also measured 5.8% labeling ribose-5-p and 25.4% labeling sedoheptulose-7-p in the PPP pathway (Fig. 4a). These results showed that carbon from methanol could successfully pass through the glycolysis, TCA cycle, and PPP pathway. We also detected 19 amino acids, including Ala, Arg, Asp, Glu, Asn, Gln, Gly, His, Ile, Leu, Lys, Met, Phe, Pro, Ser, Thr, Trp, Tyr, and Val, and 13 amino acids were labeled. Among the labeled amino acids, Val, Ala, Leu, Trp, Phe, and Met were derived from the glycolysis intermediates. Thr, Ile, Arg, Glu, Gln, and Pro were the amino acids derived from TCA cycle intermediates. Although the labeling pool of these amino acids was lower than 10%, except for Thr (11.7%) (Fig. 4c, d), their detection indicated that carbon from methanol could be assimilated into metabolic pathways that branched off of central carbon metabolism, and then used for synthesizing important cell components. In addition, among the detected metabolites, many of them were labeled by multiple carbons. For example, approximately 52.9% of Glu-6-p, 5.0% of Gly-3-p, and 13.6% of pyruvate involved in the glycolysis pathway exhibited M + 2 labeling (Fig. 4a). Also, approximately 1.3% of aconitate contained M + 2 labeling, and 1.2% contained M + 5 labeling (Fig. 4b). For the compound α-ketoglutarate (α-KG), 0.4% contained M + 4 labeling and 0.5% was fully labeled. 2.1% of the malate contained M + 2 labeling, 1.4% contained M + 3 labeling, and 4.1% was fully labeled (Fig. 4b). Similarly, 0.6% of succinate contained M + 2 labeling (Fig. 4b). We also found that approximately 8.6% of Thr contained M + 2 labeling (Fig. 4d). The detection of multiple carbon-labeled metabolites indicated that the RuMP cycle successfully worked in the recombinant E. coli BL21/NudF-Mdh2-Hps-Phi. Whitaker et al. previously demonstrated in vivo conversion of methanol to naringenin in synthetic E. coli. Leßmeier also confirmed that the nonnatural carbon substrate methanol could be converted at least partially to cadaverine as a nonnative product by a recombinant C. glutamicum strain . These works show the potential of methanol to act as a carbon source for the production of value-added chemicals in synthetic methylotrophy. As methanol possesses a high degree of reduction, its consumption can improve the intracellular NADH availability used for facilitating the synthesis of some reductive products. Here, we attempted to use the NADH from methanol consumption to generate NADPH to expand the bioconversion of methanol for improving the synthesis of reductive products in synthetic methylotrophic E. coli. Amino acids represent one of the largest classes of fermentation products whose syntheses are closely correlated with the availability of NAD(P)H. The synthesis of 1 mol lysine, for example, requires 4 mol NADPH. Several efforts have been made to enhance the supply of NADPH for improved lysine production . Here, we selected lysine as a test case, and engineered the lysine synthetic pathway and NADPH generation pathway from NADH in the recombinant E. coli BL21/ΔfrmA-NudF-Mdh2-Hps-Phi (Fig. 5a). As no lysine was labeled from the above 13C-methanol-labeling experiment in E. coli BL21/ΔfrmA-NudF-Mdh2-Hps-Phi (Fig. 4c), we also focused on whether the carbon flux from methanol could be directed to generate lysine after the reconstruction of the metabolic pathway. With the recombinant E. coli BL21/ΔfrmA-NudF-Mdh2-Hps-Phi, no lysine was detected in the medium. To improve lysine production, the key genes involved in lysine biosynthesis, including dapA, dapB, PPC, and lysCfbr (a lysine-insensitive aspartokinase) [20, 21], were co-overexpressed in the recombinant E. coli BL21/ΔfrmA-NudF-Mdh2-Hps-Phi to generate E. coli BL21/ΔfrmA-ML. Thereafter, 0.06 g/L lysine was produced after fermenting for 24 h, with glucose as the sole carbon source (Fig. 5b). Then, methanol was added into the medium to determine its effect on lysine production. After fermenting for 24 h, E. coli BL21/ΔfrmA-ML consumed 9.5 mM of methanol (Fig. 5c), while the methanol metabolism significantly increased the intracellular NADH pool (Fig. 5d). However, production of lysine moderately increased in E. coli BL21/ΔfrmA-ML when methanol was used as a co-substrate (Fig. 5b). To explore the potential of methanol metabolism in improving lysine production, we constructed a NADPH-regenerating system from NADH by expressing NADH kinase (Pos5p) from S. cerevisiae  in E. coli BL21/ΔfrmA-ML (Fig. 5a). The intracellular NADH pool was largely decreased when POS5 was expressed in E. coli BL21/ΔfrmA-ML (Fig. 5d). This engineering strategy successfully enhanced lysine production by twofold when methanol was present, while lysine production was only moderately affected in the absence of methanol (Fig. 5b). At the same time, the methanol utilization ability was also improved by the overexpression of POS5. With the synthesis of lysine, the NADPH level decreased (Fig. 5e). Finally, a 13C-methanol labeled experiment was carried out to measure 13C-labeling patterns of metabolic lysine in recombinant E. coli BL21/ΔfrmA-ML, and E. coli BL21/ΔfrmA-ML-POS5 (Fig. 5f). No labeled lysine had been detected in E. coli BL21/ΔfrmA-Mdh-Hps-Phi. Through engineering the lysine biosynthetic pathway, 4.7% of lysine exhibited M + 1 labeling in the strain BL21/ΔfrmA-ML. With the overexpression of POS5, 9.0% of lysine contained M + 1 labeling. Lysine labeled by multiple carbons was not detected in the recombinant strains. The bioconversion of methanol has received considerable attention given methanol’s abundance, low price, and high electron and energy content. In recent years, several efforts have been made to engineer E. coli as a synthetic methylotrophy [15, 16, 23, 24]. However, little methanol utilization has been demonstrated to date [12, 15]. 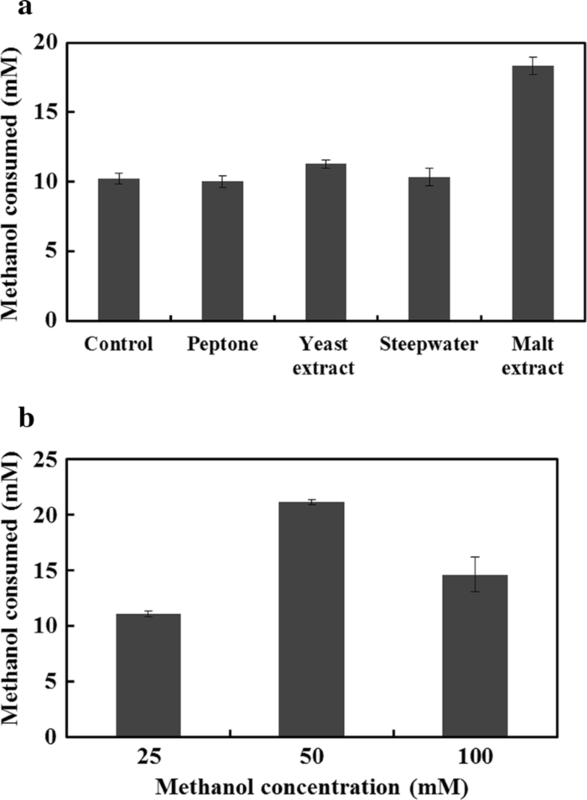 MDH activity is one of the key factors limiting methanol metabolism efficiency. To address this problem, several strategies—including a scaffoldless strategy to organize MDH, HPS, and PHI into an supramolecular enzyme complex, or screening alternative MDHs with higher levels of activity from other organisms—have been pursued for enhanced methanol utilization in methylotrophic E. coli [15, 25]. Here, through the coexpression of the endogenous activator protein ACT, interaction of which with MDH leads to a conformational change to position NAD+ and methanol binding sites closer together enabling direct electron transfer , the methanol utilization of the methylotrophic E. coli was improved. In addition, we found that the methanol metabolism was achieved more efficiently with another endogenous ACT-like Nudix hydrolase, NudF from E. coli. Through the coexpression of NudF, the synthetic methylotrophic E. coli consumed about 11.9 mM of methanol at a rate of 0.24 mM MeOH/h, the highest value in synthetic methylotrophic E. coli reported to date [12, 15]. Prior to that, the highest methanol consumption level in engineered E. coli was reported by Whitaker’s group, where the synthetic methyltrophic E. coli was constructed by employing a superior NAD-dependent MDH from B. stearothermophilus and ribulose monophosphate (RuMP) pathway enzymes from B. methanolicus, and 10 mM of methanol was consumed within the fermentation of 72 h . Further engineering the current MDH or sourcing other activator proteins could be performed in the future to optimize methanol utilization in synthetic methylotrophic E. coli. To date, the bioconversion of methanol to high-value chemicals by synthetic methylotrophic E. coli was rarely demonstrated . Whitaker et al. successfully measured the production of naringenin through the combination of plasmid-based modules for both methanol assimilation and naringenin biosynthesis. Here, we give another example to broaden the potential of methanol to produce value-added chemicals as the carbon source. That the biosynthesis of most useful metabolites produced by industrial organisms requires electrons in the form of NADH or NADPH is well known. Given the high degree of reduction of MeOH, we selected the compound lysine, biosynthesis of which was closely associated with intracellular NADPH supply, to demonstrate the bioconversion of methanol. Notably, through engineering methanol metabolism, lysine biosynthesis, and NADPH regeneration pathway from NADH, the carbon flux from methanol to lysine was tracked, and the increased lysine production was observed. Our results further show the potential of methanol in the bioconversion of value-added chemicals as a carbon source, and confirmed the potential of methanol to improve biosynthesis of some NAD(P)H-dependent metabolites. During the methanol bioconversion to lysine, we found that the expression of POS5 for improved lysine biosynthesis could further drive methanol metabolism. The methanol consumption of E. coli BL21/ΔfrmA-ML-POS5 was improved by 1.3-fold compared to E. coli BL21/ΔfrmA-ML. One of the key obstacles limiting methanol assimilation in synthetic methylotrophic E. coli is the thermodynamically challenging oxidation of methanol to formaldehyde with NAD+ as electron acceptor. Woolston et al. identified that NADH was a potent kinetic inhibitor of this enzyme. The typical cellular levels of NADH could inhibit MDH activity by ~ 50% . In the present study, the expression of POS5 from S. cerevisiae converted the extra NADH to generate NADPH for lysine production, and largely decreased the intracellular NADH level (Fig. 5d), which was of great benefit for improving methanol oxidation. Our wok provides an example how a new sink pulls upstream methanol utilization, which in return increases rate of NAD(P)H-dependent product generation. However, methanol metabolism efficiency was still far below the industrial application level at present, and the use of methanol as the sole carbon source was also a challenge in synthetic methylotrophy. As we observed in this study, the synthetic E. coli could not grow on methanol as the sole carbon when glucose was absent. In future studies, improving ribulose-5-phosphate regeneration, and developing MDH variants insensitive to NADH level, would be the focus for the further engineering of synthetic methylotrophic E. coli strain. A synthetic methylotrophic E. coli was engineered using a NAD+-dependent MDH and RuMP pathway. To improve methanol oxidation, the effect of the MDH activator protein was determined in vivo. In addition, the engineered E. coli strain was endowed with the ability to convert methanol into value-added metabolites. More importantly, we demonstrated for the first time an example of reconstructing the intracellular cofactor regeneration pathway based on methanol oxidation to improve the synthesis of NADPH-dependent metabolite, and further drive methanol consumption. All the strains and plasmids used in this study are listed in Additional file 1: Table S1. The primers used for plasmids construction are presented in Additional file 1: Table S2. The gene Mdh2, Hps-Phi operon, and ACT from Bacillus methanolicus MGA3 were codon-optimized and synthesized by Sprin GenBioTech CO., LTD (Nanjing, China), respectively. The Mdh2 fragment was inserted into NcoI/BamHI sites of plasmid pETDuet to yield plasmid pETDuet-Mdh2. The Hps-Phi operon was inserted into NdeI/XhoI sites of pETDuet-Mdh2 and pETDuet-1 to generate plasmid pETDuet-Mdh2-Hps-Phi and pETDuet-Hps-Phi, respectively. Then, the gene NudF amplified from E. coli MG1655 genome with primer 1 and primer 2 was inserted into SacI/SalI sites of pETDuet-Mdh2 and pETDuet-Mdh2-Hps-Phi to generate plasmid pETDuet-NudF-Mdh2 and pETDuet-NudF-Mdh2-Hps-Phi. The fragment of ACT replaced the gene nudF to generate plasmid pETDuet-ACT-Mdh and pETDuet-ACT-Mdh-Hps-Phi. The gene POS5 was amplified from Saccharomyces cerevisiae genome with primer 3 and primer 4 and inserted into NdeI/XhoI sites of pETDuet to generate plasmid pETDuet-POS5. Subsequently, the DNA fragment of T7-POS5 amplified from plasmid pETDuet-POS5 with primer 5 and primer 6 was inserted into XhoI site of pETDuet-ACT-Mdh2-Hps-Phi to generate plasmid pETDuet-ACT-Mdh2-Hps-Phi-POS5. The DNA fragment of dapA-dapB-LysCfbr was amplified from plasmid pTrc99a-dapA-dapB-LysCfbr constructed in our previous study with primer 7 and primer 8 , which was then inserted into SpeI/NcoI sites of pCWJ-PPC to yield the plasmids pCWJ-dapA-dapB-LysCfbr-PPC. For deleting frmA gene, the plasmid pTarget-frmA, used in frmA modification with a targeting N20 sequence, was constructed and cotransformed to E. coli BL21(DE3) with plasmid pCas9 and donor DNA. With the plasmid pTarget as a template, the pTarget-frmA was obtained by inverse PCR with the primer Target-frmA-F and Target-frmA-R and followed by self-ligation. A 1000-bp donor sequence was designed by overlap PCR with the E. coli genome as a template. The E. coli strains were cultured in Luri-Bertani (LB) medium which contained 10 g/L tryptone, 5 g/L yeast extract, and 5 g/L NaCl. The M9 medium supplemented with 10 g/L glucose, 0.5 g/L NaCl, 10 g/L NH4Cl, 3 g/L KH2PO4, and 17.1 g/L NaHPO4·12H2O was used for the analysis of methanol consumption and enzyme assays. Gene expression was induced by 0.05 mM of isopropyl -d-1-thiogalactopyranoside (IPTG). The strain was cultured at 200 rpm and 37 °C. Appropriate antibiotics were added at the following concentrations: ampicillin, 100 μg/mL, chloramphenicol, 34 μg/mL. For the fermentation, a single colony was inoculated into the LB medium supplemented with 100 μg/mL Amp or 34 μg/mL Cm, and cultivated for 10 h approximately. Then, the cultures were centrifuged, and resuspended in 50 mL M9 medium. The initial OD600 was 0.3 and incubated at 37 °C and 200 rpm. After about 3 h, 0.05 mM IPTG and certain concentration of methanol were added. To optimize the methanol utilization, the experiment was carried out at the different methanol concentrations ranging from 50 mM to 200 mM. The effects of nitrogen sources, including peptone, yeast extract, steepwater, and malt extract were also investigated. The concentrations of the nitrogen source was 1 g/L. The in vivo activity of MDH was assayed by the production of the formaldehyde. Cells were grown over night in LB medium. Subsequently, amount of cells corresponding to an OD600 of 1 in a volume of 10 mL was pelleted by centrifugation at 5000×g for 5 min and resuspended in 9 mL M9 medium. The experiment was started by the addition of 1 mL 500 mM methanol, and the cultures were kept at 37 °C. Samples were taken at the specific intervals, and 100 μL of the supernatant was mixed with the same volume of Nash reagent to determine the formaldehyde concentration . One unit (U) was defined as the amount of enzyme that is required to produce 1 μmol formaldehyde produced per minute. The activity of Hps-Phi operon was assayed by the consumption of the formaldehyde. Cells were prepared as described above. The reaction was started by adding 0.35 mM formaldehyde. One unit (U) was defined as the amount of enzyme that is required to consume 1 μmol formaldehyde per minute. For the determination of 13C-labeled intracellular metabolites, the assimilation of methanol in recombinant E. coli strains was monitored by a 13C-methanol-labeling experiment. The strain E. coli BL21/ΔfrmA-NudF-Mdh-Hps-Phi was cultivated in LB medium supplemented with 100 µg/mL Amp and 0.5 mM IPTG for 10–12 h. Cells were then transferred to M9 medium with 50 mM 13C-methanol (Sigma-Aldrich). After the fermentation of 25 h, cells were collected and pretreated as the following steps. Quenching and metabolite extraction were performed according to the methods described previously with minor modifications . The supernatant (800 μL) of metabolite extracts was transferred into a 1.5 mL EP tube, and lyophilizated under low temperature. The dry extracts were then reconstituted in 300 μL of acetonitrile:H2O (1:1, v/v), sonicated for 10 min and centrifuged 15 min at 10,000×g and 4 °C to remove insoluble debris. The supernatants were transferred to HPLC vials and stored at − 80 °C prior to LC–MS/MS analysis. For the determination of 13C-labeled lysine, E. coli BL21/ML-POS5 was cultivated, sampled, and treated as the above steps. For each sample, three replicates were carried out. Cell growth was determined by measuring the OD600 using a Beckman Coulter DU370 spectrophotometer. Methanol concentrations were measured using an Agilent 1290 Infinity System (Santa Clara, CA, USA) equipped with an Aminex HPX-87H column. l-Lysine was determined using SBA-40E immobilized enzyme biosensor (Shandong, China) . NADH and NADPH were assayed by means of the NAD/NADH quantitation Kit and the NADP/NADPH quantitation Kit (Sigma-Aldrich). LC–MS/MS analyses were performed using an UHPLC system (1290, Agilent Technologies) equipped with a UPLC BEH Amide column (1.7 μm, 2.1*100 mm, Waters) coupled to Triple TOF 6600 (Q-TOF, AB Sciex). The mobile phase consisted of 25 mM NH4OAc and 25 mM NH4OH in water (pH = 9.75) (A), and acetonitrile (B) was carried with elution gradient as follows: 0 min-95% B, 0.5 min-95% B, 7 min-65% B, 8 min-40% B, 9 min-40% B, 9.1 min-95%, and B, 12 min-95% B, which was delivered at 0.5 mL/min. The injection volume was 1 μL. The Triple TOF mass spectrometer was used to assess its ability to acquire MS/MS spectra on an information-dependent basis (IDA) during a LC/MS experiment. ESI source conditions were set as follows: Ion source gas 1 as 60, Ion source gas 2 as 60, Curtain gas as 35, source temperature 550 °C, Ion Spray Voltage Floating (ISVF) 5500 V or − 4500 V in positive or negative modes, respectively. WX, LX, WXL, CKq, and OYPK designed the experiments; WX conducted the experiments, and WX and LX, wrote the paper. All authors read and approved the final manuscript. The authors are grateful for the financial support the Open Funding Project of the State Key Laboratory of Bioreactor Engineering. The National Nature Science Foundation of China (Grant No. 21576134, Grant No. 21606127, Grant No. 21390200, Grant No. 21706126), and the National Key Research and Development Program of China (Grant No. 2016YFA0204300). 13068_2019_1356_MOESM1_ESM.docx Additional file 1: Table S1. Strains and plasmids used in this work. Table S2. Primers used in this study. Figure S1. The growth of BL21/ΔfrmA-NudF-Mdh2-Hps-Phi under the different concentration of methanol.